Absolutely no residue; Can be used on any surface; Gripper compresses against surface to hold furniture where it belongs. If World Series excitement moved your furniture, then you need Lil Grippers!! These heavy-duty gripping pads offer superior protection for all of your hard household floors and surfaces, protecting against scratches and marring of floors and furniture. Perfect for whole home protection, our Lil Grippers protect all of your home's surfaces and furniture. And made Entirely in the United States of America at our Lil Gripper Factory. Protect the beauty of your floors and household surfaces with high quality Lil Grippers. Made from heavy duty materials, Lil Grippers branded product come in a wide selection of sizes for complete surface protection. Simply the best product to keep furniture from sliding! FREE SAME-DAY First-Class Shipping!! Protects All FLOOR Surfaces: Including Hardwood, Laminate, Tile, Stone, Vinyl, Concrete. Thin, Clean & Attractive look - virtually non-visible once in place! The material is similar to memory foam. The weight of your furniture creates a contour around the furniture leg to keep your furniture in place WITHOUT the use of adhesives, which would leave a residue. Add to this, the bottom of the gripper naturally clings to your flooring surface and will not move once it is in place for a short period of time. In short, they just work and do so very well! Please remember, our product is backed by our unconditional satisfaction guarantee. Waterproof and made in the USA from recycled materials! No unsightly felt to attract dust and pet dander. If you have any questions about this product by Lil Grippers, contact us by completing and submitting the form below. If you are looking for a specif part number, please include it with your message. SlipToGrip Furniture Pads - Combo Pack - 24 Pieces 2" Wide - Includes 2" Round Pads (8 Pieces) PLUS 4" Square Prescored Pads (4 Pieces - Makes 16 2" pcs). Stops Furniture Slipping. It works! 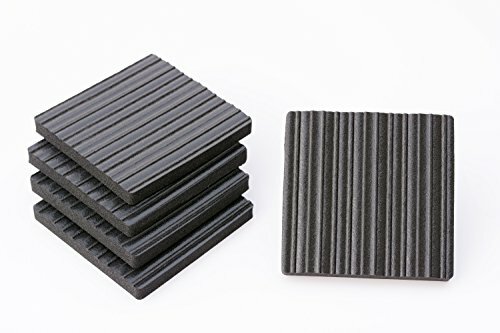 Sumnacon Adjustable Felt Pads Furniture Levelers for Table, Chair, Furniture Legs, 16 Pcs Heavy Duty High Density Felt Floor Protector with Metal T-Nuts - Adjustable Height 0.5" to 1"